There's no better introduction to Edinburgh — the historical, cultural, and political capital of Scotland — than a walk straight down the spine of the old town. Stretching from a hill-topping castle to a queen's palace, this ramble is appropriately called the Royal Mile. Despite being crammed with tourists, it's one of Europe's best sightseeing walks. I begin my stroll on the bluff where Edinburgh was born and where a castle now stands. Over the centuries, this mighty fortress was home to many of Scotland's kings and queens. Today it's well worth touring to see the old buildings, stunning views, and crown jewels. 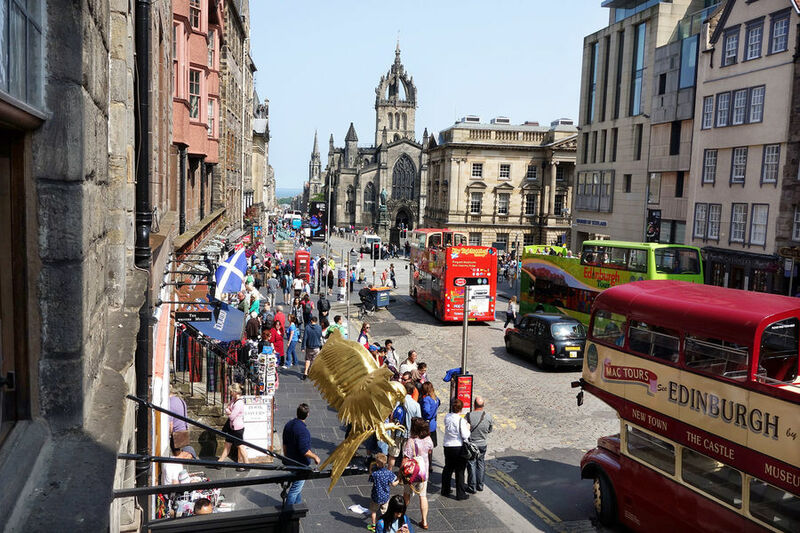 As Edinburgh grew, it spilled downhill along the sloping ridge that became the Royal Mile. Back in the 1600s, this was the city's main street, bustling with breweries, printing presses, and banks. With tens of thousands of citizens squeezed into the narrow confines of the old town, there was nowhere to go but up. So builders lined the street with multistory residences called tenements — some 10 stories and higher. My next stop, Gladstone's Land — a restored merchant's house with costumed guides and an almost-lived-in, furnished interior — helps me picture those days. Though much of the Royal Mile is now a touristy mall filled with tartans, shortbread, and Scottish kitsch, it's still packed with history. 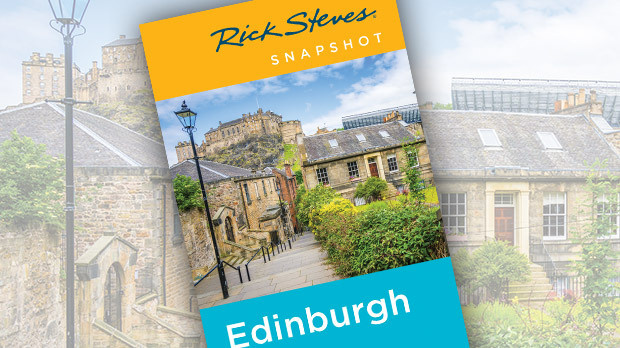 Exploring back alleys and side lanes, it's easy to imagine Edinburgh in the 17th and 18th centuries, when visitors scurried through these alleyways, buying and selling goods and popping into taverns. Everywhere I turn, the Royal Mile is littered with symbols of Scottish pride — from a statue of philosopher David Hume, one of the towering figures of the Scottish Enlightenment of the mid-1700s, to its very own Church of Scotland, embodied by St. Giles' Cathedral. Filled with monuments, plaques, and stained-glass windows dedicated to great Scots and historical moments, St. Giles' serves as a kind of Scottish Westminster Abbey. St. Giles' is also the home church of John Knox, whose fiery sermons helped turn once-Catholic Edinburgh into a bastion of Protestantism. Knox's influence was huge. 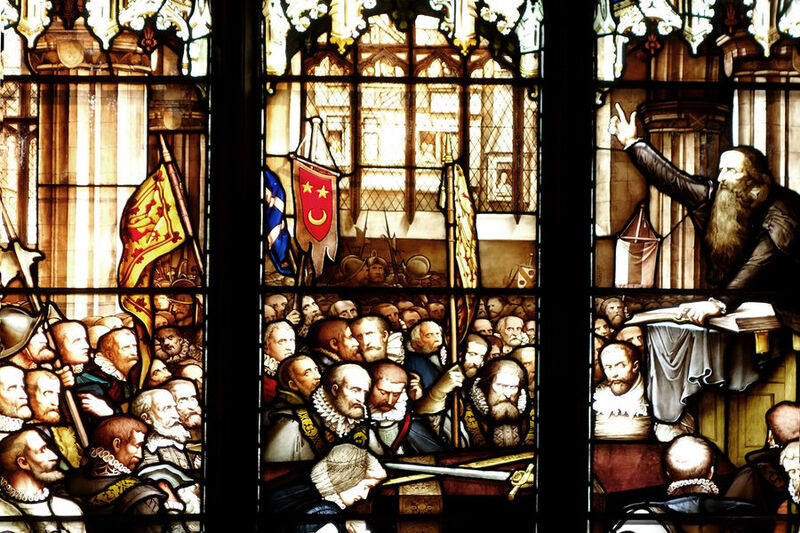 His insistence that every person should be able to read the word of God firsthand helped give Scotland an educational system 300 years ahead of the rest of Europe. A dramatic stained-glass window shows the commotion that surrounded Knox when he preached. With his hand on the holy book, Knox seems to conduct divine electricity to the Scottish faithful packing the church. Just down the road from St. Giles' is the John Knox House, featuring atmospheric rooms, period furniture, and a fun little dress-up corner that lets me play out my great reformer fantasy. And just past the John Knox House are two enjoyable stops: Lickety Splits Gallery and Cadenhead's Whisky Shop. At Lickety Splits, Naomi sells traditional candies and local crafts. I come here not just for a sugar high, but to learn fascinating tidbits on the origins of some of Scotland's favorite childhood treats — such as the scandal over how Chelsea Whoppers became Tootsie Rolls. Whisky is high on the experience list of most visitors to Scotland. While there are plenty of distillery tours, a visit to a fine whisky shop like Cadenhead's offers a chance to gain an education and buy a small bottle filled directly from the cask of your choice. Founded in 1842, Cadenhead's prides itself on bottling pure whisky without watering it down or adding cosmetic coloring. Popping in, I'm shown a shelf of aged wooden casks. The shop owner explains, "A single cask whisky is like a football team where all the players come from the same town." Sipping this whisky with an expert, I see why Scots call this drink "a very good friend." Fortified, I continue down the Royal Mile. Finally, after centuries of history, I've reached modern times: the Scottish parliament building. After 300 years of being ruled from London, the Scots regained their own parliament in 1999, and a few years later built this striking, eco-friendly home for it. This soaring building mixes wild angles, lots of light, bold windows, oak, and local stone into a startling complex that seems to be surging right out of the rock of Arthur's Seat, the craggy summit just beyond the base of the Royal Mile. For a conversation starter, ask a local what he or she thinks about the building. To get a peek inside and a lesson in how the Scottish Parliament works, drop in, pass through security, and find the visitors' desk. You're welcome in the public parts of the building, including the impressive Debating Chambers. My last stop is the Palace of Holyroodhouse, one of Queen Elizabeth's official residences and the home of Scottish royalty, including James IV and Mary, Queen of Scots. The Scottish monarchs also kept a home at the top end of the Mile, but they preferred the cushier Holyroodhouse to the blustery castle on the rock. I've soaked up plenty of Scottish history on my walk from castle to palace. But no Royal Mile walk is complete without dropping by a pub — and there's no shortage of them — where a bit of live music and whisky await.